Our bagel soap looks just like a real New York bagel, but don't eat it. 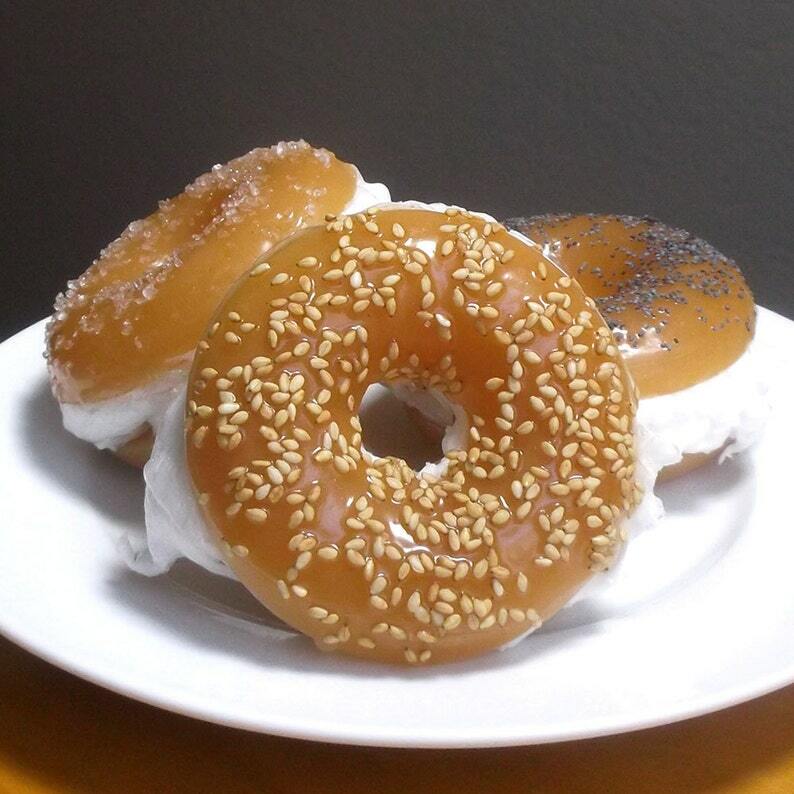 Bagel is sliced in half and layered with a heaping portion of smooth cream cheese (whipped soap). 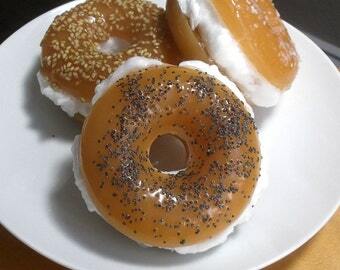 Bagels are sprinkled with poppy seeds, sea salt, or sesame seeds for a mild exfoliating effect. Available in blueberry, cream cheese, and lemon scent with your choice of salt, poppy seeds, or sesame seeds. Bagel soap makes a great soap gift, party favor, holiday soap gift, or gift for teacher or mom. Bagel weighs approximately 4 ounces. Approximately 3" round and 1 3/4"h.
Each one is unique! Because the soap is handmade, there will be slight differences in batches. Glycerin (kosher, of vegetable origin), Coconut Oil, Palm Oil, Safflower Oil, Purified Water, Sodium Hydroxide (saponifying agent), Sorbitol (moisturizer), Sorbitan oleate (emulsifier), Oat protein (conditioner), Color, Iron Oxide, Mica, Scent, Sea Salt, Poppy Seeds. Got this soap as a gift and it is incredibly cute! It was actually bigger than I was expecting which was a pleasant surprise. :) Would definitely buy again.